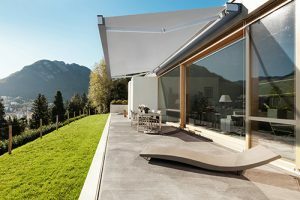 Outdoor living specialists and G18 Award finalists, the Milwood Group have officially launched the Heston range, their brand-new collection of premium awnings. Combining three distinct awning systems, the new Heston range is designed to provide installers with a premium solution to suit any outdoor space. While the Heston Light boasts a sharp, modern design, the Heston Flat features a smooth, more rounded finish. The star of the range, however, is the Heston Pro which offers a discreet, yet high-performance system. Whilst the Heston Light delivers a more compact solution with projections up to 3.6 metres and a span of six metres, the Heston Flat and Pro systems offer a slightly larger solution with 12-metre spans. The range-topping Pro can even achieve a reach of 4.3 metres out from the property. The new Heston range joins a whole host of awning solutions as part of Milwood’s offering, and sits alongside their full range of aluminium verandas, canopies, pergolas and glass rooms. Trusted by over 150 trade partners nationwide, the Milwood range is manufactured in the UK using the Kent-firm’s bespoke extrusions. Each system is available with fast turnarounds thanks to their centrally located distribution centre in Leicestershire.